This post will either amuse you, because you can relate to it, or repel you – because you can’t. We’ve had our dog for a year and half. We crate trained him until recently, which meant that he was in his crate when we’d leave the house periodically throughout the day and he slept in it at night. Gradually he became house-trained so we trusted him to roam freely and not destroy our house. It was then time to let him loose at night. But where would he choose to sleep? This being our first dog, we didn’t have any idea how to handle sleeping arrangements. Surprisingly, the children did not want him in their rooms. They have single beds and felt he wouldn’t fit comfortably. Interesting how they wanted us to get a dog so badly but then pulled the “not in my room” when it was crunch time. So the bedroom doors were closed and the dog was left to wander around the house to figure out where to sleep. He chose the his favorite steps near the front door. The problem was he could see outside and would bark whenever he saw deer or anything else – usually at 2:00 a.m. So much for that experiment. I decided to let him try sleeping on our king size bed. And wouldn’t you know it, he liked it. He was quiet throughout the night. Slept like a baby – actually, better than a baby. There was no crying or tossing and turning, no paws in my face or kicks to my kidneys. He was just a black, furry twenty-five pound ball of cuteness at the foot of our bed. The truth is – I kind of liked it too. My husband? He won’t admit it, but I think he doesn’t hate it. “Dad likes the dog better now that he’s sleeping in your bed,” my children observed. I have noticed that the dog likes to sleep late, like my husband, which I think adds to their bonding experience. Like father like sheepadoodle son. “How did this happen? 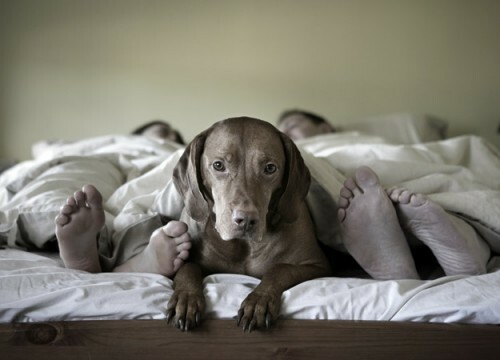 The children never slept in our bed, but now the dog is?” he asked. Go figure. It’s true – we were never proponents of the family bed. We were just too selfish and cherished our own comfort and sleep. We thought it was important for the kids to be able to soothe themselves, or something like that. Maybe we’re failing our dog and he won’t be able to self-soothe. Nah – he happily slept in a crate for 18 months. He’s a pack animal and now we’re his pack. I bought a doggie bed for the bedroom floor, or anywhere outside of my bedroom, to no avail. I have polled friends about where their dogs sleep. Dogs in the parental boudoir seems to be a common practice. I think we’re stuck with this sleeping arrangement for now, with the lack of privacy and all. Never say never, I’ve learned. It’s best to let sleeping dogs lie. Kramer our 65 pound black Lab has slept in our bed since he was big enough to jump up onto it. He is a great bedwarmer for those cold Minnesota winter nights! He has a comfy orthopedic foam bed at the foot of our bed for daytime naps, but his nighttimes are reserved for the pillowtop bed with Mom and Dad. Interestingly, our other dog that was adopted as a stray and probably was out in the wilderness on her own for a while sleeps on our bed during the day and in her own bed at night, she likes to have bedding all to herself and not share. No way! No dogs in our bedroom. Boomer is a couch man. We sleep with two dogs on the floor and two cats in the bed. When my husband suggested having the dogs sleep downstairs I said “Oh that’s so terrible. They will be lonely!” To which my husband replied “Really. You couldn’t get those babies out of our room fast enough.” I think it is because babies don’t have tails and floppy ears they can move. Xo! The good life for Lewes D.! Lucky Lewes……… The kids will eventually go off on their own……Lewes will always be there with you unless he chooses a room of his own???? Then u & Brad will finally have your privacy back!!! It is awesome in the beginning until they get older – you try and go to bed and they are like a 50 pound rock on your pillow that won’t budge – compromise my friend, one or two nights a week is all they need. My younger dog is still in the crate – it is his home turf and he is fine….other one gets the couch. Life is still good for them – what better life could they ask for – they are DOGS!